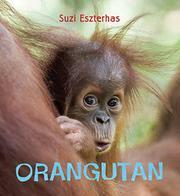 Laying on the cute with a shovel, Eszterhas tracks an orangutan from birth to maturity in photos and anthropomorphic commentary. Clambering over her distracted mother and often looking directly out at viewers, the hairy little imp shows plenty of personality as she suckles, learns to feed herself and gradually releases her tight hold on her parent’s long red hair. Though the big, clear photos are all taken in the wild, the author’s narrative frequently uses simile and metaphor to draw parallels with human behaviors with lines like “Mom is like an acrobat and uses her long arms to swing from branch to branch,” and “On the baby orangutan’s first birthday climbing lessons begin.” The young primate ultimately becomes independent (“she loves to hang out with friends”), but when she finally has a baby of her own, she will introduce it “to her mother—Grandma orangutan.” Eszterhas uses the same approach in the simultaneously publishing Sea Otter, but with less of the “awww, gee” factor since the mother and baby otters are so intertwined in the photos they’re hard to tell apart. Both volumes end with fact pages. Both also feature jacket flaps that partially cover stunning endpaper photographs.